Here’s Part 1 of my 2 part video training series on SMART Marketing – 7 Easy Steps to More Sales, my Marketing Planning system so easy that any business can follow the steps and create their own marketing campaign. SMART Marketing is based on targeting your marketing efforts – a sniper’s rifle rather than a shotgun – aimed at a very focused target market. You need to attract them with the benefits that your product or service will bring them very quickly, and send messages that scream of the needs they have that will be met. 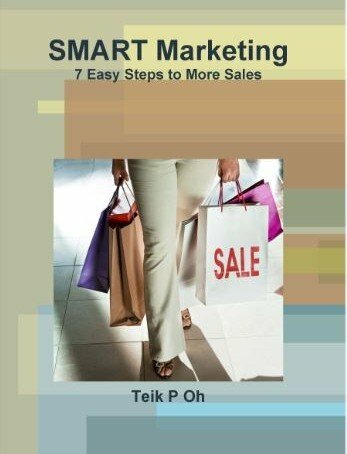 It’s based on a book I have written called SMART Marketing – 7 Easy Steps to More Sales available from Amazon.com and is accompanied by the SMART Marketing Workbook. Click on the links to take you to Amazon to order. This is a 15 minute video training session so I won’t take up too much of your time with this – go on, click on the video and enjoy! I hope you enjoyed the training on SMART Marketing. Now, don’t miss Part 2 – go to the website teikoh.com and subscribe so that it is delivered directly to your inbox. And remember that you can order the books from Amazon – both SMART Marketing – 7 Easy Steps to More Sales and The SMART Marketing Workbook.